SSG Lined Riding Glove, Work'n Horse Glove in Dark Brown. Great glove at a price you won't believe! 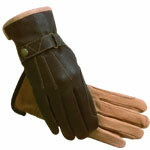 Lined leather glove with dome fastener cinch and closure.